1: Workin' (In The Big City) (4:37) Rating: 5 Lyrics by: Brian McNally Record date: 05/12/2002 AAD by MX Skroch Copyright © 2002 The Sheep Fiends Foundation. 2: The Birth Canal (8:42) Rating: 2 Lyrics by: MX Skroch Record date: 05/12/2002 AAD by MX Skroch Copyright © 2002 The Sheep Fiends Foundation. 3: Gonna Funk U Up (3:59) Rating: 2 Lyrics by: David Ladd & MX Skroch Record date: 05/12/2002 AAD by MX Skroch Copyright © 2002 The Sheep Fiends Foundation. 4: Looking Out A Window Staring Into Space (3:53) Rating: 3 Lyrics by: Brian Cameron Record date: 05/12/2002 AAD by MX Skroch Copyright © 2002 The Sheep Fiends Foundation. 5: How's Your Mom? (4:08) Rating: 1 Lyrics by: MX Skroch Record date: 05/12/2002 AAD by MX Skroch Copyright © 2002 The Sheep Fiends Foundation. 6: Stay Away (4:16) Rating: 1 Lyrics by: Matthew Cramer Record date: 05/12/2002 AAD by MX Skroch Copyright © 2002 The Sheep Fiends Foundation. 7: You're Not Immortal (2:16) Rating: 2 Lyrics by: Brian McNally Record date: 05/12/2002 AAD by MX Skroch Copyright © 2002 The Sheep Fiends Foundation. 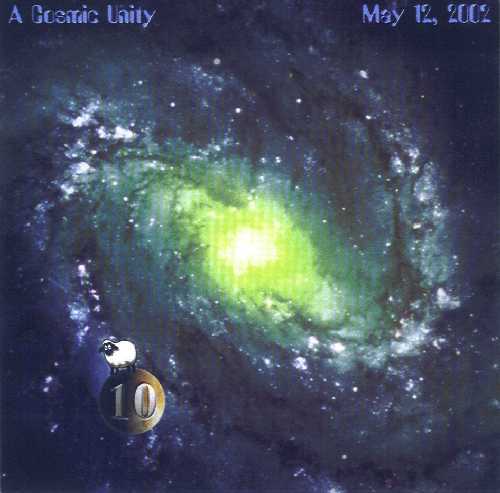 8: A Cosmic Unity (8:08) Rating: 5 Lyrics by: MX Skroch Record date: 05/12/2002 Also appears on: A Cosmic Unity AAD by MX Skroch Copyright © 2002 The Sheep Fiends Foundation. 9: The End Of The World (5:31) Rating: 2 Lyrics by: Brian McNally Record date: 05/12/2002 AAD by MX Skroch Copyright © 2002 The Sheep Fiends Foundation. 10: Lonnie And The Fun Rockers (5:52) Rating: 2 Lyrics by: MX Skroch Record date: 05/12/2002 AAD by MX Skroch Copyright © 2002 The Sheep Fiends Foundation. 11: Water Heater (6:46) Rating: 1 Lyrics by: David Ladd Record date: 05/12/2002 AAD by MX Skroch Copyright © 2002 The Sheep Fiends Foundation. 12: Ten Years Ago (10:06) Rating: 1 Lyrics by: MX Skroch Record date: 05/12/2002 AAD by MX Skroch Copyright © 2002 The Sheep Fiends Foundation.